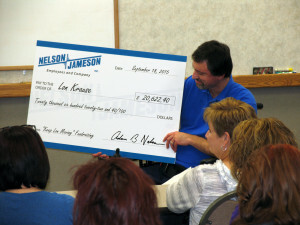 MARSHFIELD, WIS., Sept. 14, 2015 – When Lon Krause of Marshfield, Wisconsin created a GoFundMe online fundraising campaign in May, his co-workers and employer knew they wanted to help. Krause, 45, was diagnosed with Muscular Dystrophy when he was 13 years old. He has recently reached a major turning point in the progression of the disease, including limited ability to stand and the need for a lift device. For several years, Krause has been using a power wheelchair, but it required numerous repairs. In addition to needing a lift device and new wheelchair, Krause’s home and vehicle demanded modifications as well. With the help of generous local businesses and Krause’s co-workers, family and friends, the committee raised over $10,000 in just a few short months. “I am overwhelmed by the support of my coworkers and everyone involved. The efforts and donations made truly reflect the kind of company this is and I feel honored and proud to be a part of it. I hope to continue to be a part of this generous ‘family’ environment as long as I can,” said Krause. Q: What month is National Food Safety month? That being said, The National Restaurant Association named September “National Food Safety Month” for the first time back in 1994. Now an annual event each September, National Food Safety Month is dedicated as a time to “heighten awareness about the importance of food safety education”. 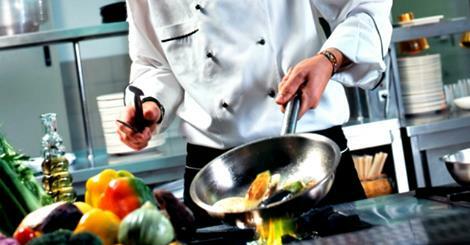 The Association offers numerous tools, videos, and activities meant to get the restaurant and food service industries talking about, learning about, and reviewing food safety standards. You can find a full range of these materials at foodsafetymonth.com. So, restaurant and food service employees, wish your fellow industry colleagues a “Happy National Food Safety Month!” throughout September. In fact, why not do the same for the other 11 months of the year as well? Keep checking right here on our Wide-Line Blog for food safety developments/news for the food industry, highlighting topics that range from the farm to the table. In just less than two weeks, Chicago will be filled with food and beverage industry professionals from around the world when Process Expo 2015 gets under way. McCormick Place will host not only Process Expo, but also InterBev Process, and the International Dairy Show September 15-18. New data loggers from Madgetech, allergen test kits, 3M Petrifilm™, Ohaus meters, Atago refractometers, and our 926 Chloride Analyzer from our Laboratory Products Department. Our Process Systems Department will be showcasing their sanitary hose assemblies, Delavan Spray Dry Nozzles, new MagTraps™ separators, Lafferty foamers, spray balls, hose nozzles, valves and more! On display from our MRO Department, there will be new safety products, our color-coded products, color-coded metal detectable, and metal detectable products. We will also have one of the popular models of Nilfisk vacuums on display. You don’t want to miss this show – be sure to visit us at Booth 6520. Register for a free exhibit pass here.